After days of talks, North and South Korea have agreed to march together at the 2018 Winter Olympics under a unified flag. North and South Korean athletes will march together at the 2018 Winter Olympics under a unified flag. 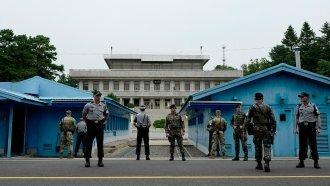 South Korea announced the decision Wednesday after days of talks with its northern neighbor at the Demilitarized Zone between the countries. This is a pretty big deal — North and South Korea haven't been on great terms for a while. But it seems like the relationship may be on the upswing. The last time they marched together under a unified flag for the Olympics was in 2006 in Turin, Italy. North Korea's Kim Jong-un said during his New Year's Day speech the countries should work toward peace. He also recently reopened a key communication line to the South for the first time in almost two years. In addition to marching under a single flag, skiers from the North and South will train together, and performers from the countries will hold a joint cultural event.